Daniëlle here with something a little different this time! I created a little piece of mixed media art for you, inspired by this months moodboard. Check out How to Create Mixed Media Art With Daniëlle by Art Anthology on Snapguide. This entry was posted in Colorations, Daniëlle Noorman, Design Team, Minx Shimmering Inks, Mixed Media, Rust Texture Set, Sorbet, Stencil, Uncategorized, Velvet and tagged Colorations, Daniëlle Noorman, Design Team, Minx Inks, mixed media, sorbet, stencil, velvet on September 10, 2018 by Danielle Noorman. This entry was posted in Art Journal, collage, Colorations, Daniëlle Noorman, Minx Shimmering Inks, Mixed Media, Mud, Sorbet, Stencil, Stone Effects, Velvet and tagged art journaling, Collage, Colorations, Daniëlle Noorman, Minx Inks, mixed media, Moodboard, Mud, sorbet, Stenciling, Stone Effects, velvet on August 15, 2018 by Danielle Noorman. HI Friends, Its Karan Gerber here with you today. After being on a few cruises i just love the look of portholes and although i didnt have a porthole to alter, i thought i could maybe create something similar and share it with my crafty friends. 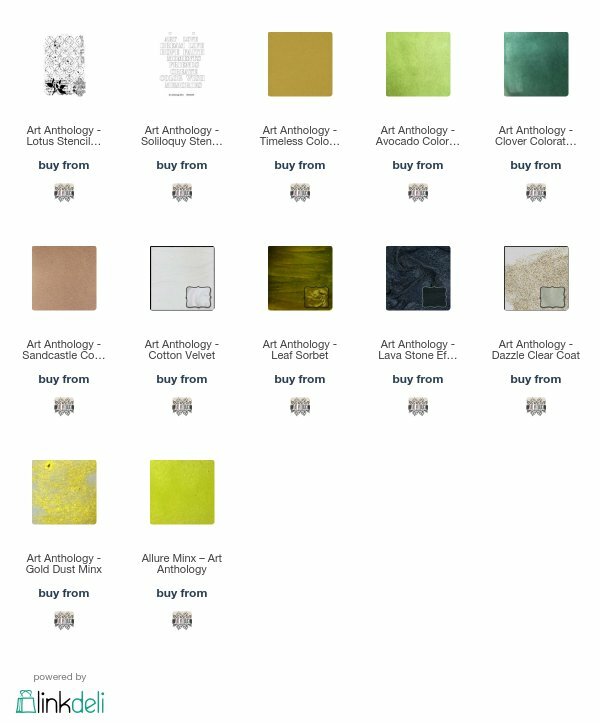 Check out How to Create an Altered Canvas by Art Anthology on Snapguide. This entry was posted in Canvas, Design Team, Home Decor, Karan Gerber, Minx Shimmering Inks, Mixed Media, Rust Texture Set, Velvet and tagged altered art, art anthology, canvas, Design Team, gesso, Home Decor, Minx Inks, mixed media, velvet on February 12, 2018 by DesignTeam. Check out How to Create a Journal Cover With Karan Gerber by Art Anthology on Snapguide. If you are looking for more inspiration check out Art Anthology on Pinterest and YouTube.You can also join our Facebook group Art Anthology’s Adventures in Art, where you can share your creations! This entry was posted in Art Journal, Colorations, Design Team, Fairy Dust, Karan Gerber, Minx Shimmering Inks, Mixed Media, Rust Texture Set and tagged canvas, Colorations, Colorations Spray, Design Team, gesso, Minx Inks, mixed media on January 11, 2018 by DesignTeam. I used parts of the Lotus Stencil for the focal point in the background and to add some extra texture. By using the Minx inks to outline the Lotus flower it now looks like its shining even brighter. I always like to add hidden interest to a project. The Dazzle paint is perfect for that as it dries clear and just leaves this amazing sparkle. This entry was posted in Canvas, Colorations, Design Team, Minx Shimmering Inks, Mixed Media, Sorbet, Stencil and tagged art anthology, canvas, Colorations, Colorations Spray, Design Team, Minx Inks, Minx Shimmering Inks, mixed media, sorbet, stencil, stencils on November 20, 2017 by DesignTeam.